People who were around to see it remember why the Pennsylvania Firebacks Halley's Comet Fireback reminds us of how special the return of Halley's Comet was in 1985-1986. Just as that was a once-in-a-lifetime event for most of us, so this fireback is a once-in-a-lifetime purchase. The Pennsylvania Firebacks Halley's Comet Fireback, like all Pennsylvania Firebacks, is hand-made of 100% solid cast iron in the USA. This high-quality fireback serves several purposes in your fireplace. The decorative aspect adds visual interest to the fireplace and provides a perfect backdrop for either a log fire or gas logs. Perhaps more importantly, the fireback provides insulation to the fireplace and protects the masonry from damage, saving you costly repairs in the future. Firebacks additionally help radiate the fire's heat outwards into the room, creating more focused and efficient heating for the home. 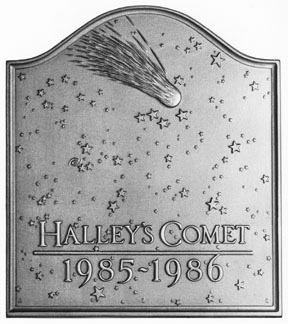 Don't wait for Halley's Comet to come around again to purchase a great fireback. Keep a constant reminder of it in your home. The next time it does come around, you'll still be enjoying the wonderful look and warmth of your Pennsylvania Firebacks Halley's Comet Fireback.